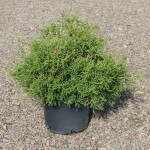 A slow growing, compact pyramidal shrub with twisted, glossy dark green foliage. The twisting form is reminiscent of coral, hence the name. It grows best in full sun to part shade, in an average, medium moisture, well-drained soil. Useful as specimens or for foundation plantings.